7 of these schools are in Fairfield County and 5 are in Westchester County, ranging from as far south as Scarsdale, NY to as north as Fairfield, CT.
improves attention, concentration, motor skills and academic performance. But above all, the classes are a lot of fun for both children and caregivers. 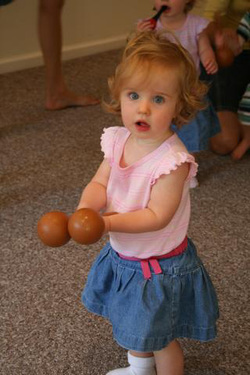 Children use shakers, rhythm sticks, scarves, drums, bells, toy ducks, and other manipulatives.